Scoring: RRS A2 low point system. 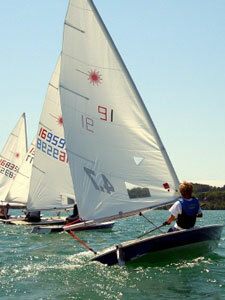 Seven races planned, but more may be sailed, time permitting. There will be a throwout if more than five races are sailed. Awards: First three A and B Fleets, and first Master (45-54), Grand Master (55-64), Great Grand Master (65+), Junior and Female. Individual award categories may be dropped or modified based on the number of preregistered entrants in each category. Registration entry fee is $50 and includes Saturday Hors d'Oeuvres ( cash bar and dinner on your own) at The Cove restaurant, Sunday continental breakfast and lunch for one person. Please email Fred Heslop - fheslop11@gmail.com if you plan on attending so we can get an approximate head count for meals. For additional information contact Fred Heslop as above or leave a message at: (435) 640-3995.